Please enjoy these videos from the Down Syndrome Track that took place at the AutismOne Conference in May of 2012. This track was organized by the new non profit, Down Syndrome OPTIONs, of which I am president. Dr. Norman Schwartz's Biomedical Basics: Where to Begin The video plays the end first and then the beginning in the middle, so let the whole video download and then fast forward to the end, then let it continue to play and it will start at the beginning. Then to hear the question and answer section, start from the beginning again. Dr. Schwartz will also be presenting at the Down Syndrome Cruise Conference. Dr. Richard Deth on Understanding the Problem in Down Syndrome. Dr. Anju Usman's presentation on Exploring Options for Down Syndrome. At 28 months old, Jett recognizes and can name numbers 0 to 100. (He says "ten-ten" for one hundred, for some reason.) He does count with me, but I have no idea if he has a concept of numbers yet. (Maybe he understands one, two and three? He seems to get those right...) He does know triangle, square, circle, rectangle and oval. At 34 months, he knows the concept of 0-10. He says "empty" to explain "zero." And he knows all his shapes, even complicated ones. I put both hands together and said, "a heart" and he tried to do it and said, "a polygon!" Late into his third year, Jett can also count by tens, identify patterns of 3 or less, sort and classify like items and add and subtract physical objects (not on paper, with symbols). At 4 years old, Jett got tested through the local school district and the school psychologist was excited to tell me that Jett could do all the math, including adding and subtracting (using pictures and manipulatives -- but the math "sentences" like 2+2=?, he didn't get all of those right, but he did get some right!) So, my math strategy is working! Not only because he is learning, but because HE LOVES MATH! Where do you start teaching math? To begin, I'd read this article from RightStart Mathematics on Math and the Young Child. It's a 2-page overview on how to introduce math concepts early. You'll find a presentation called The Future of Primary Math that has no sound, but if you click through the slides, you'll get the idea of what they mean. It's important to keep it fun. Have your child stop the activities BEFORE he gets tired of it so he always want more and is excited to participate each and every time. Don't feel like you have to buy all the stuff in each activity, a lot of things you can find around your house, borrow from friends and even check out from the library! Numicon free printables including the numicon shapes. 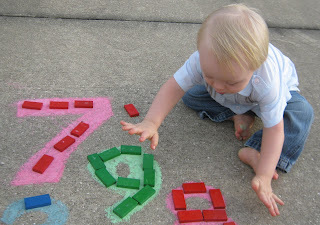 Jett placing colored dominoes on chalk letters. We started using one at 34 months old. It's a great way for kids to see and touch numbers to get a better understanding of number values. Jett loves the abacus! Here is the overview on how to introduce the abacus. Or you can purchase their entire program. Kay Ness, Jett's neurodevelopmentalist, highly recommends it. 1) Say a number and slide the beads across to show it on the abacus. 2) Say the same number and ask your child to slide the beads across. Using this method, your child will easily recognize 6, 7, and 8 beads without counting, just by visualizing. Also, let's say you choose 6 beads on one wire and 8 on the next one. You can show how the five and five on those two wires makes ten, and some are left over for early introduction to subtraction and addition. The M&D abacus that I painted with watercolors. I added painter's tape on the sides and wrote 10/ten, 20/twenty... in silver marker. Learning how to count by tens and fives makes a lot of sense when you show your child on the abacus. The picture above shows how I modified Jett's abacus for teaching him to count by tens. Early Learning Activities with "Teddy Bear Counters"
Learning and having fun with shapes can start with this durable Melissa & Doug Beginner Pattern Blocks set (left). It's sturdy and thick enough for little fingers to manipulate over and over. It's important for them to have "real world" experience with shapes to help them see and feel for themselves these early representations of geometry, fractions and many other more elevated concepts work. Jett doing the rabbit puzzle in the M & D Pattern Blocks and Boards. The next step would be the Melissa & Doug Pattern Blocks and Boards (right). These puzzles are more complicated and have smaller, but still durable pieces to play with. The wooden boards have pictures made from the shapes and your child places the matching shape piece on top to complete the colorful picture. The Learning Journey Match It! Shape Shuffle has 88 shape pieces and 17 double-sided cards that teach shapes and patterns with progressing difficulty. Jett started this at 32 months old and likes it a lot. The first card has pictures of the shapes on it and the child simply puts the shape on top to match. The other cards have pictures made from the shapes (like the M & D one). Not good for children who still put things in their mouth since the shapes are smaller and made of cardboard. It would be better if these shapes were a bit sturdier because if your child sweeps his hand/arm across it, it does shift. But, if your child is pretty neat and careful, he won't get too frustrated. At 32 months, Jett was more successful with the M & D version even though he enjoyed this one as well. The Down Syndrome Foundation of Orange County's (DSFOC) "The Learning Program" offers materials for free on their website. Registration required. They have an "Everyday Math" handout with plenty of activity ideas for prenumber concepts and early number concepts such as sorting, comparing objects and patterning. Early number concepts include rote counting, counting with meaning and number symbol (numeral) recognition. -- from Bill and Ria's Blog. Jett loves doing worksheets in his Crayola dry erase "folder." I enclose it so that he can write all over it and we can reuse the sheet as needed or give it away to others when we are done. If I forget, he follows me around insisting on doing his worksheets. Other moms call it "funsheets" but Jett thinks they are fun anyway. As with all of these activities, offer opportunities for learning, but don't force it or your child to sit for long periods of time hunched over worksheets. Free kindergarten math worksheets from School Sparks. Free Counting Pages from Early Learning Activities. Free P-K math worksheets from TouchMath. Free Shapes Worksheets from Kids Learning Station. Free Preschool Pattern Worksheets from Kids Learning Station. Free Preschool Numbers Worksheets from Kids Learning Station. You can check out/subscribe to my youtube channel "andiandi222" and see the over 700 short educational videos I've collected. There are a lot of videos that show shapes, songs, numbers and other math concepts as well as reading support. The playlist is called "Math Concepts 3.5 years old" and then there are plenty math videos sprinkled throughout other playlists. For a more multi-sensory approach to learning math using manipulatives, there are teaching resources like Numicon, which was developed in the UK and is available at downsed USA's online store. - from Bill and Ria's Blog. Here's Numicon's resources for children 3-5 years old. Numicon free printables, including the numicon shapes. Nathan Purdy's mom, Barbara, says that the Math-U-See program is the one curriculum she highly recommends for learning math. The man who developed it has a son with T21 so he understood the need for making the abstract concepts concrete. It isn't specifically for people with disabilities, but seems to work especially well for many of them. She says, "We also did Touch Math prior to Math-U-See and I found that to be very easy for Nathan to learn adding, subtracting and multiplying although it wasn't until the Math-U-See that he began to understand what he was actually doing, even though he was able to get the right answer with Touch Math." 2+2 Free Math Software your child can work with when s/he is able to use the mouse. Counting, addition, subtraction, multiplication and division. Teaching Math to People With Down Syndrome and Other Hands-On Learners: Basic Survival Skills (Topics in Down Syndrome) Book 1 by DeAnna Horstmeier has many activities for learning prenumber and early number concepts. This free e-book includes a brief discussion of the five main components of any basic math program including graphing. In addition, this e-book includes time-tested tips and strategies (plus 38 worksheets). One Two Buckle My Shoe: Math Activities For Young Children by Sam Ed Brown You can get this for about a penny on Amazon. These books are fun and educational all are Jett-tested and approved. Is It Larger? Is It Smaller? by Tana Habon, a pictures-only book with photographs of objects of varying sizes. BIG & Little : Board Book by Todd Parr has nice, bright pictures and big, simple text. 1, 2, Buckle My Shoe by Anna Grossnickle Hines is a nice first counting book only some pages have words. Five Little Chicks (Classic Board Books) by Nancy Tafuri Fun to read aloud with rhyme and repetition, sturdy board book, with nice, but detailed pictures and fairly big, bold words. Five Little Pumpkins by Iris Van Renbach Big, bold words with rhyming. Pictures are a little too busy and detailed for young babies. Quack and Count by Keith Baker. This book is awesome for multi-age groups because although the text is simple there are two levels of math on each page. Simple duck counting as well as addition to arrive at the same number. Just Enough Carrots (MathStart 1) by Stuart J. Murphy is a wonderful book about the concepts of less, more and the same amount. On the Launch Pad: A Counting Book About Rockets by Michael Dahl is fun to count down from 12-1. 1-2-3 Peas (Classic Board Books) by Keith Baker, with huge, colorful numbers and the corresponding amount of peas doing silly activities throughout the book. It covers the essential numbers between 1 and 100 and is helpful to introduce the idea of larger numbers. Zero by Kathryn Otoshi learning about the shapes of numbers. Mouse Count by Ellen Stoll Walsh, seems to be a counting book, it also serves as an early introduction to addition and subtraction. Inch by Inch by Leo Lionni, is a delightful Caldecott Honor Book that will appeal to all ages. Ten Black Dots by Donald Crews This is a strangely written book and pictures are odd too. But, it has nice sized words and very simple, bright pictures. Jett enjoyed this one a lot, although we didn't. Good from the library! One More Bunny Board Book : Adding from one to ten by Rick Walton Illustrated by Page Miglio Great book. Eleven big words per page. Nice big words, separated from picture. Fun to read, exclamation points, rhyming words, about activities that toddlers can relate to. Great introduction to addition. Help Me Learn Addition by Jean Marzollo, is an adorable book using photographs of figurines and rhyming narrative to introduce basic addition equations in a way that appeals to young readers. Math Appeal: Mind-Stretching Math Riddles by Greg Tang and Harry Briggs. At 3 1/2 years old, Jett loved all of their books with short, fun math poems that cover a range of math levels. Including Math Potatoes, Math for all Seasons, Math Fables and The Grapes Of Math . How Do Octopi Eat Pizza Pie? Pizza Math (I Love Math) is part of the I Love Math Series... At 3.5 and 4 years old, Jett loves these books! Squirrel promises to divide her pie into sections for her animal friends if she wins the pie contest. A child helps a circus clown find the animals that have escaped from a train. Little Bear makes a tiny snowball that she puts on the end of her nose, but it falls off and rolls down the hill, becoming a very big snowball in the process. An astronaut in a magic moon machine agrees to take a child with her on her journey, but the child has so much baggage the machine will not fly. Team Umizoomi is on Nick, Jr. and is the first preschool show that focuses on early math skills. It's a half an hour long and features counting, pattern recognition, shape recognition, search and seek, puzzles and sorting and classifying--all in a fun way. At 37 months, Jett loves the show and excitedly participates to answer their questions. He even eagerly wears his "TV glasses" (therapeutic glasses) in order to be allowed to watch it--even putting the glasses on himself! There's even a Team Umizoomi math kit. Here's a review of it at Ourkidsmom.com. You can purchase it at ToysRus for about $20. Looks very interesting! Monster Math is very similar to Team Umizoomi in concept. The next step is Peg + Cat, a fabulous PBS show that, at 4 years old, Jett loves. It's all about various concepts of math and is also very creative and entertaining. "Problems" are no longer scarey, they are all challenges to merrily solve. Jett goes around the house creating "problems" to solve. I know, I'm a lucky mom. Injini There's a great free version, but the full is $25. (Maybe even worth it!) It has find it, puzzles, matching, a simon-says-type game, a fun writing game and more. It is very good. Eurotalk Math age 3-5 Love this app! (I think it's $5?) It shows how to do each lesson very simply, both visually and verbally. It slowly expands on each concept (except patterns, I think it goes a little too fast. And the writing is hard too. I'd do the Injini first before getting to the writing part). It's only positive, no "wrong," just try again, and doesn't go overboard with "WOW! YOU DID IT!" kind of response for each little thing. It's very low key. It covers a lot, including number recognition, patterns, shapes, sorting and writing in a friendly, colorful, fun but not crazy way. It's also not loud or flashy. Patterns by EdNinja has cute pictures and lively music to teach patterns. Monster Math uses monsters and animals in simple equations. i learn with Boing has cute games to learn counting. Math in Action helps with sorting. Little Writer by Alligator Apps helps the child learn to write numbers. Trash Stash with Peep and the Big, Big World is a simple sorting app. Blogger mom, Laura, shares her favorite picks. Count by rote at least to 20, but preferably a little beyond. Count backwards from 10 to 0. The should also be exposed to two-digit numbers. Here's a great post on teaching kids addition techniques/math facts called Mental Math Addition Strategies from Teaching the Early Years blog. Here's a great post on teaching kids subtraction techniques/math facts called Mental Math Subtraction Strategies from Teaching the Early Years blog. Video of Jett reading at 19 months.